Yay! I’m back….Well sort of. My busy time is over, but I’ll still keep commissions closed for now since I’ll be away for most of the next week. Unfortunately, this spring gave me no time to scripting the next part of the MotP story-line. Since I have both worked and studied this spring while also making a portfolio for my applications. But hopefully I’ll get the story roll on again soon. In the meantime, this has been a piece I have been considering doing for some time now. 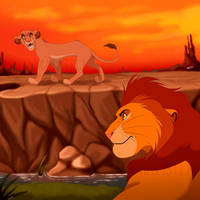 This one takes place right before the final battle between the Outsiders and Simba's pride in TLK 2. And is my take on why Kion is not a part of the battle. In my HC, Kion do not have the roar of the elders. If Kion really had the powers to send animals flying by roaring, the war in TLK 2 would have been over in like two seconds. Assuming he didn’t die, turned evil or left the Pride Lands before then that is. English is my second language and I have done my best to find misspells and grammars. But feel free to correct wrongs if you see them as long as you are polite about it. Simba and Nala halted in their path and looked over their shoulders. As they peered through the heavy rain, they spotted a golden and red shape making his way through the group of gathering lionesses. Behind him they could also spot the blurry shapes of a hippo, a honey badger, a cheetah and a white bird. Simba clenched his teeth together and his face got a grim look as his son came toward them. “Lead the lionesses on, I’ll catch up to you later.” He told his queen. They exchanged a sad yet determined look. As they had gathered the pride for battle, they had both agreed that their children would take no part in this. If they themselves would not live through this war, they would at least die knowing Kion and Kiara was safe. Nala threw one last look at her youngest cub before meeting her mates eyes. Simba nodded and turned to face their son. Wailing a little between his teeth against the pain from the wounds Zira's lionesses had caused in their last encounter. It also reminded him of the low odds he faced in surviving this battle. Kion was by now a teenager with a sprouting red mane that barely meet around his neck. He had only been leading the new lion guard for a few months. But despite his young age and lack of a proper teacher. Kion had so far done his job well, going well beyond his father’s expectations. Simba had first doubted his son’s ability to lead the guard force, thinking he was still too young. Especially when Kion had ignored the traditions around selecting the new guard’s members. But in the end, Kion’s choices had paid of and the new lion guard had been surprisingly effective. For that, Simba couldn't be more proud of his young son. But this was a threat Kion wouldn’t be dealing with. “Turn back, Kion.” Simba cut his son of. Kion’s surprised face then turned angry as he glared at Simba in defiance. Kion flinched, but his face remained defiant. “You still don’t trust me? Is that it!? We have dealt with these outsiders before and many other threats! How much more must me and my team do to prove ourselves worthy of your trust? 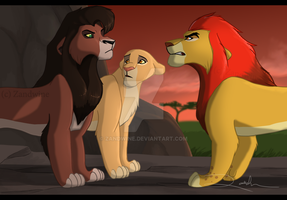 !” Kion yelled as he glared at the older lion. Simba now thought he saw tears streaming out of Kions angry eyes, but it was hard to tell in the pouring rain. At this, Simba took a deep breath and calmed his voice. The last conversation he had with Kiara had been a bitter one, he didn’t want to part ways with Kion on a bad note as well. “No, Kion. That’s not it, this is not about trust.” Simba looked over Kion’s shoulder at the rest of the guard force. “But...” The anger slowly melted from Kion’s face and left only desperation. “… Dad, you’re hurt! You’ll never survive this...” Kion’s voice cracked at the last words. Simba then dragged Kion toward him and hugged him tightly. Kion looked back at his father like a lost desperate cub. But eventually, his face hardened and he wiped his tears away. Simba felt his chest swell with pride and tears sting in his own eyes as he hugged his son one last time. For a second, Kion just stared back at Simba. Like he wanted to say something. But instead he quickly turned around and ran of toward the rest of the guard force, leading them in a different direction, away from the battle. Both of them had refused to say goodbye, because it would have meant that there was no hope. Simba watched as they fast became small dots in the distance before he hurried after Nala and the rest of the pride. Now more determined than ever to put an end to this war and the threat that been lingering over his family for far too long. Simba has a point. Ono and Bunga would be torn to shreds. They all likely would, except Besthe maybe. But they are all teens by this point and would not last long in battle against a whole pride of ruthless lionesses. Thank you! I'm glad you enjoy my stories. No, this particular story is meant to be a one-short. What happens next is pretty much the events in the end of TLK 2. But I have other fan fictions that continue the story after TLK 2 such as Hearts of Three and MotP. MotP: "Marks of the past"
I also have some older AU stories for Zira and Scar, but they are not canon to my HC. Oh, how I wish it was canon! You did a great job at portraying their emotions, it really connects well with the storyline which you've also done an amazing job with! I can see that being why Kion and the Lion Guard were not involved in the battle at the end of the movie. Makes sense. Poor Kion, but Simba is right. He is a good father. This is a good idea for why Kion and co. aren’t in the battle, but only because your version of Kion has no Roar of the Elders. The way I like to explain why Kion and co. weren’t in the battle or second half of the movie is that maybe they were on a mission outside the Pride Lands, maybe helping an ally pride (Maybe Malka’s pride since they can easily be fit into the canon universe) with hyenas or rogue lions that keep bothering them, and Makini went with them to heal any wounded. Yeah, that works too. It's my guess of why he was not around a lot of the time in my HC too. and I don't really want to have an excuse him not to use the roar every time something happens. So I felt it was better to simply remove it. Well Simba has his flaws, but he really loves his kids and tries to do what he thinks is best for them. This makes a lot of sense, I imagine this is what most likely happened behind the scenes. Great job! Thank you! I'm glad it does. So sad! But it makes sense. Yeah, lucky their prediction never happened and it all ended well. Ooh! Nice story! Keep up the good work! I've always kinda assumed that Kion was away on some sort of mission during TLK2. That’s exactly what I think to. That lion cub named Malka that Simba meets in the semi-canon comics, I think he can easily be fit into the canon universe. Maybe his pride is a very small one, maybe he got injured while trying to defend his pride from hyenas or rogues and he sent a plea for help to Simba, who sends Kion and the Lion Guard to help, Makini goes to so that she can heal anyone in his pride that’s injured, because maybe Malka’s pride doesn’t have a skilled healer like Rafiki is. For all we know, this is canon; not like there's any evidence to the contrary. I'm flattered that you think so, but I'm not sure xD. If Kion was still around by this time in TLK2 and was the same as in TLG show. Kion could have won the battle for Simba by just roaring the outsiders away like he did last time he met them. Yeah it's a nice story but agreed it's unrealistic when you have a roar that could destroy the entire outsider threat before they even touch one of your pride members. Still if Kion were a normal lion this'd totally be a good reason for his absence. Yeah. I don't mind the roar that much in the show. But to me, having a super lion creates story problems. So I thought it was better to simply remove it rather than to create excuses for Kion not to use it. I hope one day, we will see the rest of the gang as adults. I doubt we will, at least not anytime soon. At best, we may see them as adults in a vision in TLG show, like via a song or something like that. At least that's what I think. Man, that was feel heavy. I'm glad that it didn't end how Simba predicted but dang that moment before the battle, Poor Simba. Yeah, I suspect that if Zira knew that she would have an advantage in attacking while Simba was hurt, he would be aware of this too. Very interesting. I love how Simba knows how bad the outcome could be and how he doesn't want to risk his children's safety. Zira stated in TLK 2 that they had an advantage if they attacked when Simba was hurt, my guess is that Simba knew that too.